Every year, a group of electronic and experimental musicians gathers in the Arizona desert at the Arcosanti architectural laboratory and spends a week living and working together, rehearsing existing music and composing new music with the goal of creating a full musical program in time for a live concert at the end of the week. This festival, Different Skies, is different every year, because the participants and their backgrounds are different every year. Veterans of past festivals mingle with newcomers, old and new ideas are exchanged, and the music bears certain common themes with previous years while being wildly different in many ways. Over the course of several days' work, the musicians learn to interact, to listen to one another, and develop an instinct as to when to lay out and when to dive in. Their improvisational and listening skills are honed every evening after dinner in entirely improvised musical free-for-alls jokingly called the 'All Star Jams'. These sessions are recorded, and in the months following the festival, they are listened to, cut apart into musically intact and separate pieces, and arranged into albums for release on Earth Mantra. The first two such albums, Strange Lines and Distances and Imaginary Spaces, were taken from two distinct evening jams in 2007. For the 2008 sessions, material from four nights' jams, 17-20 September 2008, was cut apart and rearranged into two thematically consistent sets. 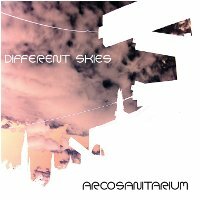 This album, Arcosanitarium, represents some of the more energetic and experimental (as well as amusing) meanderings encountered during the week's jams. Ranging all over the ambient map, these improvisations for keyboards, sequencers, electronic percussion, guitars, vocals, and unusual sound sources combine into an arresting and absorbing whole, a unique glimpse into the madness and delight of Different Skies 2008. You'll also want to experience its companion release That Merciless Sky, which combines unreleased tracks from the live concert with thematically compatible improvisations.